Topricin® Ideal Pain Relief & Healing Technology for the whole family! Changing the way we treat pain! Children get hurt – it’s a fact of life. As a parent, you cannot prevent all accidents from happening, and no matter what kind of injury, it is always hard to see your child in pain. Topricin for Children’s Pain Relief and Healing Cream is specially formulated for kids. Pediatricians recommend this paraben-free, patent-pending formula to treat pain associated with a wide range of common children’s injuries. It is perfect for muscle sprains and strains, eczema, back, heel and knee pain, and overall growing pains. Topricin is formulated for easy absorption, Topricin® for Children is also a multi-purpose healing cream for all the everyday bruising, scrapes, scratches, minor burns and insect bites that children are prone. Safe and effective, Topricin Junior uses no volatile oils such as camphor or menthol or irritating chemicals. Rather, it stimulates the body’s desire to heal the damage that is causing the pain by draining the toxins that build up in an injured area. This homeopathic medicine is manufactured in the United States, at the highest quality standards. Homeopathic medicines are safe, gentle and help the body heal. Topricin Junior is safe to use for diabetics for children ages 2 to 12. Topricin will not interfere with any medication your child may be taking. This formula is fragrance free, paraben-free, and contains no petroleum, mineral oil, lanolin, capsaicin, or menthol. It has no irritating chemicals, is non-greasy, and is a moisturizing cream. Guarantee! If you are not completely satisfied, call within 30 days of purchase for a full and unconditional refund (less S&H). Remember: For severe injury always seek medical attention! Massage into all finger joints, the base of the thumb, the palm of the hand and wrist. Include the Trapezius (large muscles on top of the shoulders) to the shoulder joint. Apply Topricin Junior for Children on the small of the back, just below the waist and down onto the buttocks and hips. Home treatment to relieve the symptoms of common stinging or biting insects/bugs, is often all that is needed, but if there is any question that this is other than a mild reaction: Seek medical attention. For leg cramp: Massage medicine from the heel on the calf up to the back of the knee. For joint pain: Apply around, above and below the entire joint. Seek medical attention for injuries to the wrists or ankles or if swelling is severe. Apply Topricin Junior for Children immediately around the ankle including the Achillestendon on the back of the ankle and under the heel. Dislocations (of the shoulder etc. ): Apply Topricin Junior for Children immediately. Seek medical help. Note: The biomedicines in Topricin Junior for Children will keep inflammation to a minimum, allowing an easier manipulation (setting the dislocated joint) by the doctor. Massage Topricin Junior for Children in until absorbed. Reapply a small amount of medicine on the most painful areas/pain center and massage in until absorbed. Reapply before going to bed and in the morning. Apply medicine 3 to 4 times a day or more often if needed. 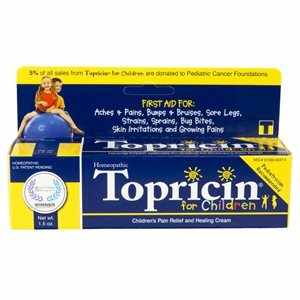 As a Preventative: Apply Topricin® for Children before and after workout or strenuous activity. Information found here is educational in nature and not intended as a substitute for professional health care. If you have,or suspect you have, a medical issue, be sure to consult your health care provider. Always let your health care professional know when you are considering any self-help treatment,especially if you are taking prescription drugs. Be sure to see your health care professional for any pain that has lasted more than 3 days.